A Superconducting Tunnel Junction (STJ - or Josephson junction) consists of two thin films of a superconducting metal such as niobium, tantalum or hafnium separated by a thin insulating layer. When operated at temperatures well below the superconductor's critical temperature (typically below 1 K), the equilibrium state of the junction is easily perturbed by any photon striking it. By applying a small bias voltage across the junction and a suitable parallel magnetic field to suppress the Josephson current, an electrical charge proportional to the energy of the perturbing photon can be extracted from the device. Figure 1: Schematic of an STJ detector. 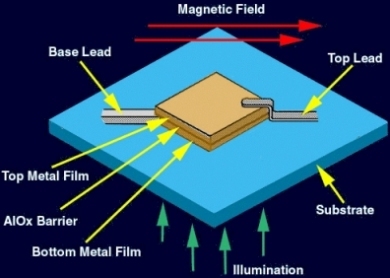 Illumination of the device can occur either directly from the top or from below through a transparent optical substrate such as sapphire or magnesium fluoride. The latter method is preferred for optical/UV applications since the properties of the lowermost film can be more carefully controlled during manufacture. Back illumination also leaves the top surface free for the wiring required for the manufacture of two dimensional arrays of STJ devices. The introduction of the STJ as an astronomical detector is in many ways the natural next step beyond the semi-conductor CCD detector. In the latter silicon-based devices, the band gap between the ground state and the state excited by the absorption of an optical photon is comparable to the photon energy. As a consequence, only a single electron is extracted from the detector per absorbed photon - irrespective of its energy. with E the photon energy, F=0.22 the Fano factor, and G~1 the tunnel noise factor. This relation is shown graphically in figure 1.2 for a few elemental superconductors with different energy gaps. Figure 2: Predicted tunnel limited energy resoving power for STJs made from superconductors with different energy gaps. Thus by measuring the charge released by each detected photon, these can be sorted in energy to an accuracy limited by the shot-noise fluctuations in the charge released. 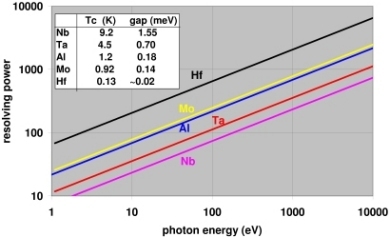 The achievable relative spectral resolution depends on the material and specifics of the STJ, but is of order one part in ten to one part in a hundred in the near-UV, varying as the square root of the photon energy. By arranging a number of STJ devices into a two dimensional array, a true "three dimensional" astronomical detector can be constructed, whose output is not just the number of photons registered in each pixel of the image, but their distribution in energy throughout the UV, visible and near-IR. This unique ability to discriminate photons in wavelength without the use of filters or dispersive elements obviously comes at a price. In order to be able to distinguish the relatively feeble charges generated by the STJ detector above the thermal background noise, it is necessary that such devices operate at extremely low temperatures, typically below one degree above absolute zero. This, in turn, requires the use of modern sophisticated cryogenic technology.